James Brereton was born in Derby in 1954, and trained at the Joseph Wright Art School, turning professional in 1979. 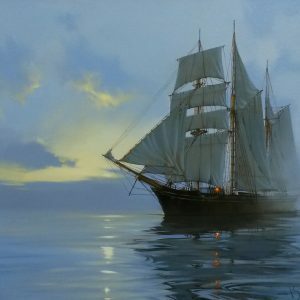 He is one of the country’s leading marine artists, and is inspired by Montague Dawson and Thomas Somerscales. 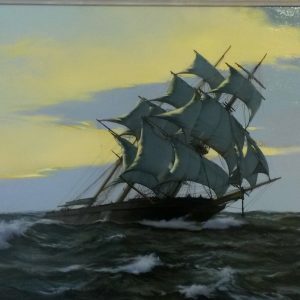 His work is recorded and illustrated in Archibalds Dictionary of Sea Painters of Europe and America, and he regularly exhibits at the Royal Society of Marine Artists. His pictures are in private collections all over the world, and sell at Sotheby’s, Christie’s and Bonham’s in both London and New York. 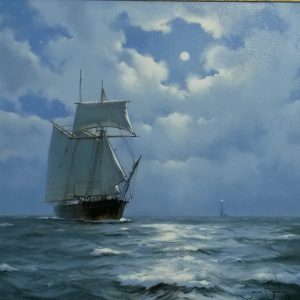 So we at Duffield Gallery feel privileged to hold a collection of James original oils on canvas pictures in classic, luxurious, handmade frames.